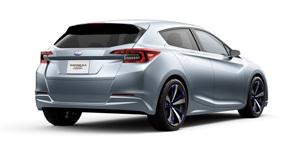 The Impreza 5-Door Concept is a design concept car previewing the next-generation Impreza which is to be the first one of Subaru’s next-generation strategic vehicles envisioned in FHI’s Mid-Term Management Vision “Prominence 2020” announced in May 2014. 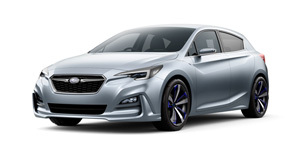 While positioned as an entry model in the Subaru lineup, its compact body features a blend of bold expressions of Subaru’s Dynamic & Solid design elements and a quality feel beyond its class – hinting at the design direction not only of the new Impreza but of Subaru’s future models as a whole. The rear combination lights sharing the same motif as the headlights, as well as the powerful shoulders over the rear fenders thrusting all the way toward the rear combination lights, express a Wide & Low stance similar to the front. The tightened cabin silhouette enhances the sporty impression of the nimble 5-door style.